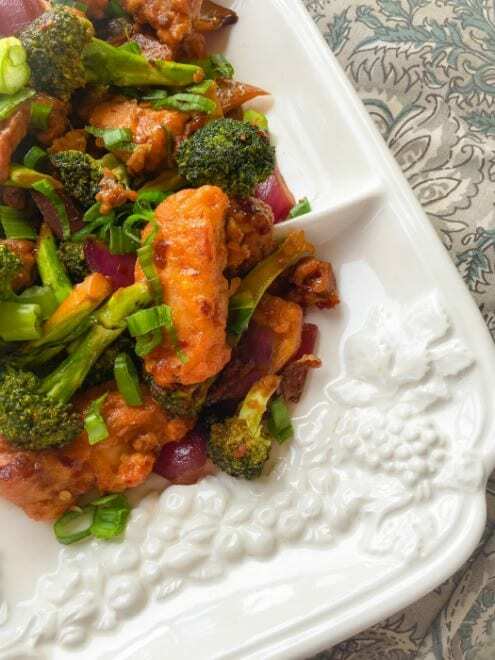 Broccoli Fish in Sweet Spicy Sauce: Mouthwatering recipe to please your sweet-spicy tastebuds. Restaurant style but made at the comfort of your home. 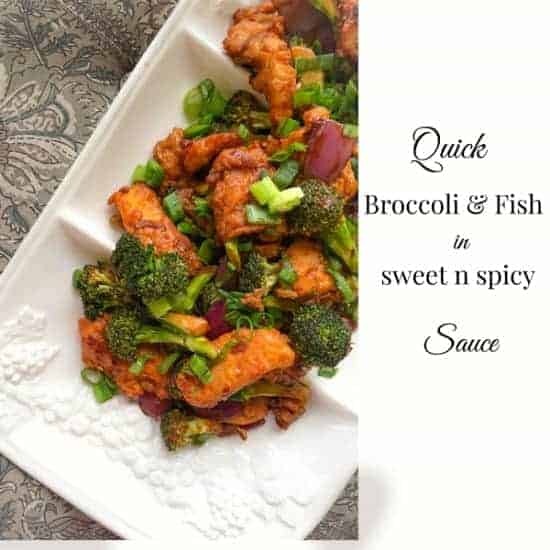 This Broccoli Fish in Sweet Spicy Sauce is my super quick recipe when I need a meal ready in 20 minutes and it’s also one of the comfort food recipes, we have grown up eating in Delhi. And this particular version is available in India or the neighboring countries. Yes, that happened to us this week and I realized ‘WHAT‘ exactly I had done when we were trying to store everything in our already overflowing fridge! So guess what our brunch menu might look like … Bazinga! 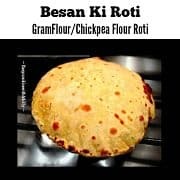 Now, I have been making this recipe since I was 17, and no, I’m not telling you how many years it has been until – (Ha Ha) and I can probably cook this even in my sleep. The beautiful orange color you’re seeing is from the chili-garlic schezwan sauce (recipe here) that I’ve used and the broccoli is lightly sauteed with the mix, once the sauce n fish is ready. 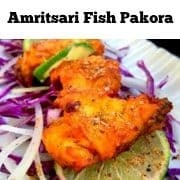 The taste comes from the shallow fried fish which has been marinated in a spicy batter and you can go a notch up or down depending on your spice level. This recipe is a perfect combination of sweet and spicy with delicious flavors. 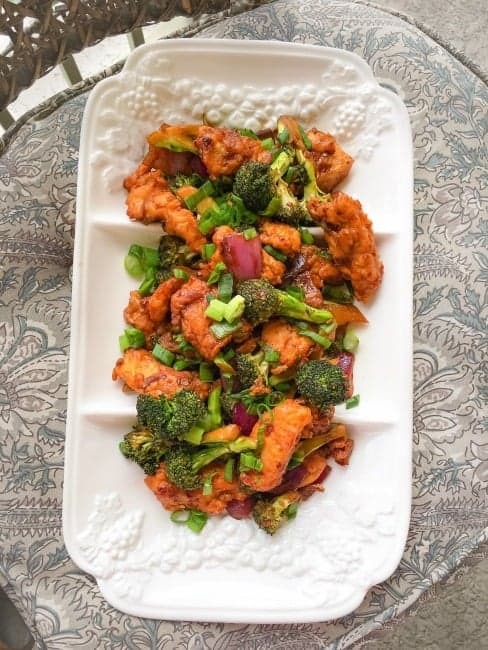 This Broccoli Fish in Sweet-Spicy Sauce is usually served with plain rice or you can do a light stir-fry rice or serve it with any other side like quinoa/noodles and even bread. (I’ve had it with baguette once…as I was super lazy to cook anything more than this). 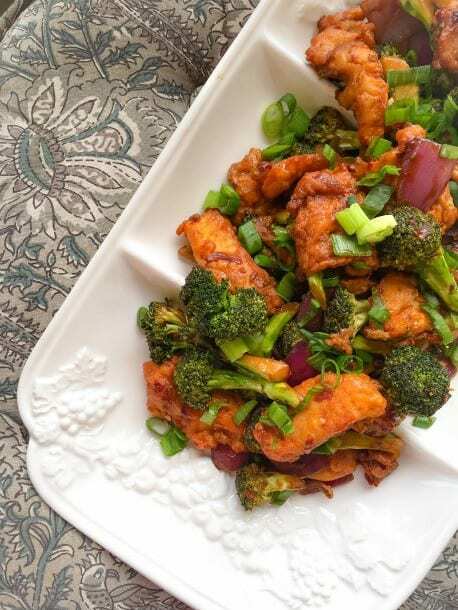 Try this Broccoli Fish in Sweet-Spicy Sauce soon and kick-start your weekend or weekday meal. What are your weekend plans? Are you visiting someplace new or just chilling with friends/family at home? 2 Tbsp Schezwan Sauce - use more or less as per taste - I'm using homemade sauce, the recipe is in the post. In a large bowl, add fish marination ingredients, mix everything to a smooth paste. Heat 1/2 cup oil in a medium pan. 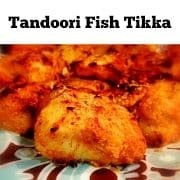 Lightly drop the marinated fish one by one (3-4 pieces at a time) and shallow fry till you get a golden crust (takes about 2 minutes). Remove and continue to fry till all the fish is fried. Keep the fish on paper towel to soak any excess oil. In a pan, add 3 tbsp oil and let it heat for a minute. Add garlic+ginger paste and saute for 1/2 minute. Now, add the onions and saute till they slightly change color (about 2 minutes). Add, broccoli and saute for a minute on high flames. In a bowl, mix soy sauce, schezwan sauce, salt, pepper, honey, water and mix evenly. Add this sauce to the cooked veggies and give it a quick toss/saute. Now add the fried fish, saute everything lightly and cover cook for about 2 minutes. Decorate with fresh green onions (optional) and Serve Hot. 26 Replies to "Broccoli Fish in Sweet Spicy Sauce"
I love this! We’re trying to get some more fish into our diet and this sounds AMAZING! Thanks for sharing! Does it have to be shallow fried or can an it be stir-fried at high heat for mostly the same results? I’m wondering if the fish would fall apart not fried? Hi Mackenzie, I shallow fried the fish but you can stir fry at a high heat too. The fish is lightly coated hence it doesn’t fall apart when fried. I love how quick this comes together. I’ll try it. Wow! simply amazing. I can eat fish in any form, as I am from coastal regions in India. So many great flavors and colors — love it! Just bought a giant amount of broccoli, so this is perfect timing for me! Hehheheh, that’s what happened with me too 😉 I bought such a Giant Bag of Broccoli ! Thanks for visiting Patricia. Yum what a delicious mix of flavours! We’ve just spent the weekend away with family on a hiking trip and now it’s time for the long drive home. You’ve just sorted dinner for us tonight – thanks! This will be perfect after our busy weekend! Awee, that sounds great – Thanks Laura! That broccoli and golden fish has me wanting to make this right now! Your photos are really appetizing and they are making me hungry! HEhehhe, thanks Jessica – I’m happy that you liked the recipe. The golden crust on the fish makes this dish totally drool-worthy. May have to add some Tilapia to the grocery list now. 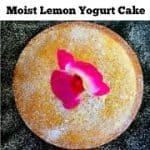 Thanks Jenn – Do give it a try, its Delicious! Wow this fish looks amazing! I totally thought it was chicken. Such a lovely texture. And the rest of the flavors in this dish are extraordinary. Beef and Broccoli was my favorite Chinese takeout dish when I was growing up, so this brings back so many memories! I love the twist of using fish here, definitely something my hubby would be obsessed with. It looks so good! Thanks Kim 🙂 Do give it a try soon! This sounds amazing — fish can be served in such bland ways in the US, I can’t wait to taste this! I bet this smells and tastes amazing, Molly! I’m definitely going to have to try this. Thanks so much 🙂 Do give it a try! 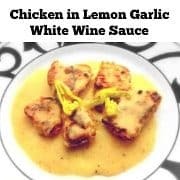 So full of flavor for such an easy dish! I just love the color.